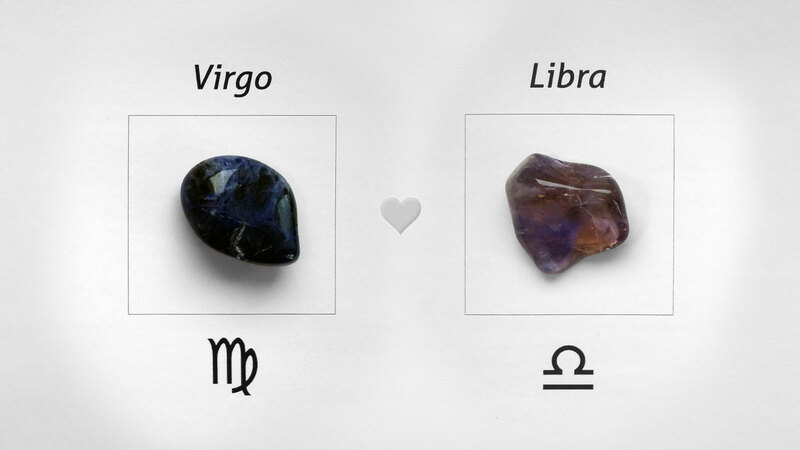 The love of Virgo and Libra is very tender. Both zodiac signs are sensitive and perceptive to each other’s needs. Occasionally, when the man and the woman do not agree with each other, you can hear a strong thunder, but see only a very faint lightning at the same time. Why? The air is the domain (the element) of Libra and the earth of Virgo. However, the voltage which is necessary to discharge during the dispute is dimmed and grounded by the mutual love. There is a lot of fuss, but soon you see the blue sky again. The Libra woman is a cuddly cub when falling in love. She is manually very skilful. Even the regional manager of Amazon born under Libra will manufacture a handmade string bracelet for the beloved Virgo man. The Virgo woman driven by the desire to understand the air, the essence of the Libra man, is able to become even a fighter pilot. The practical Libra man will start to breed bees only to produce the sweetest honey for his love. The Virgo man has a healing impact on the Libra woman that is ill by love. He will gently catch all her fears like the butterflies on the summer meadow and return them back to the Pandora’s box. Both signs are very compatible in love! The eyes of an excited Libra woman are like glowing embers in the dark. They inexorably attract the Virgo men to kiss her. On the other hand, the sexually aroused Virgo man will not be the raging bull, but he will pick up the lute and sing you a seductive song like the ancient bard. The Libra man will gently squeeze the Virgo woman, what will give her the very pleasant feeling of security. Soon she can start to shine like the sun at the sunrise. On the other hand, the Virgo woman is a nice friend at the beginning, but if the Libra man arouses her sexual instincts, she will put everything (from the work to the glasses) aside and seduce you in an instant. You can consider the sexual compatibility of the man and woman as optimal. The marriage of Virgo and Libra is something, what can not be computed on a pocket calculator nor the best NASA’s artificial intelligence machine will help you with such painful task. But, thanks to the favourable compatibility, you can be sure that the chance of success of the marriage is huge. Virgo is very practical and will solve the everyday problems silently, but with a striking grace. Libra resembles a grape. It is difficult to grow this kind of plant, but finally the marriage has very sweet fruits. There is no big space for improvising in the marriage, however, both zodiac signs can offer each other a lot! The dating of Libra and Virgo is highlighted with the favour to be active and to undertake many exciting adventures. Both are compatible in dating, but they need the proper time to find the right way to each other. Virgo is like the energy saving lamp (the fluorescent one). In the beginning Virgo starts to glow very slowly, but after a while the man or woman radiates with tremendous light. Libra is more like the bird looking for a fine nest. You have to make proper suggestions to him or her. Libra will be witty while dating, but do not expect any resolute decisions. It is sad but true – from time to time the love of these two zodiac signs ends up with the definitive breakup. Forget the compatibility, humans are imperfect. Virgo will often skip jealous scenes, but he or she is capable of making a cold „review” of your whole relationship, similar to an article in the high-tech journal describing the breakthrough model that is now unfortunately discontinued. Libra will more likely think ahead (next phone call, next holiday). It is an indecisive zodiac sign, but when she or he realizes, that there are no more bullets in the revolver of love, Libra will make a sharp cut worthy of a bold surgeon. The friendship of Virgo and Libra is full of understanding. It does not matter whether they want to undertake the journey around the world in 80 days or whether they only want to drink two couples of the green tea – Libra and Virgo are true friends in all circumstances. The friendship compatibility of both zodiac signs is with one word “great”. What links them together is the will to gain knowledge in our complex world and the will to spread worthy and noble ideas. Virgo is the one, who wants to tear a circle and straighten it in a narrow line. Libra is more cautions and completely satisfied when he or she can „only“ shake the view of others. Turning the world upside down is not the business of that man or woman, but yours. Sometimes you can hear the Virgo man swearing during the sport activity, sometimes you will see the Libra woman cheating when playing cards. Thanks to such common „imperfections“ it is clear, that these friends are common people from flash and bones. They do not want to „rescue“, nor manipulate each other (worst is always trying to change the life of others against their will, although you have their good in mind). But one thing is guaranteed, plenty of fun! Both friends have refined sense of humour what is a glue that never loses its strength.